Étudier en français au Canada, c'est possible ! Implantés dans toutes les région﻿s du Québec, les cégeps sont le 1er niveau de l'enseignement supérieur. The web server used by Cegepsquebec.ca is located near the city of Montréal, Canada and is run by Federation des Cegeps. 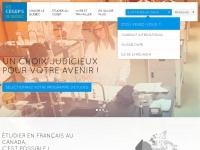 The website Cegepsquebec.ca has a own web server. The web server only runs this website. The websites were created using the programming language PHP and they are hosted on a Apache server, which runs on the operating system Cent OS (Linux). The content management system WordPress is used. The HTML pages were created with the latest standard HTML 5. The visitor analysis software Google Analytics is used to analyze the visitors of the websites. The website does not specify details about the inclusion of its content in search engines. For this reason the content will be included by search engines.